This list of low-fat foods includes most common options available at your local grocery store. Eating low-fat foods can help establish a healthy balanced eating plan. However, just as with all eating and diet plans, check with your personal physician before making any significant changes to your diet. Snack foods are quick and easy. 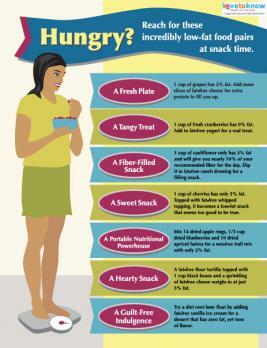 Keeping an array of low-fat snack foods on hand can help you stay on track. While fat content may vary by brand, general fat and calorie counts are listed. 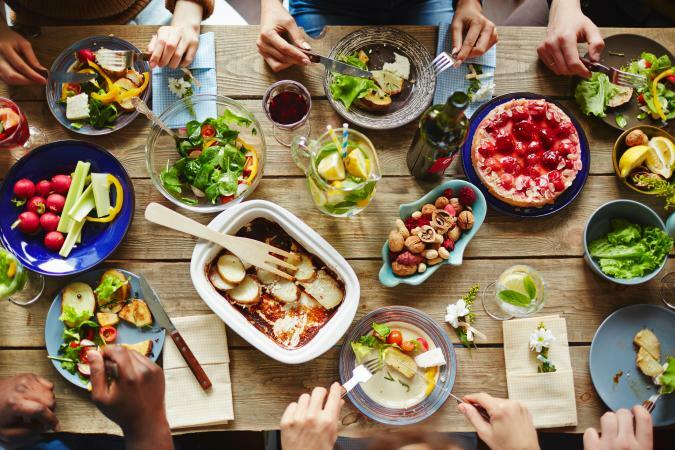 Dietary Guidelines for Americans recommends two servings of dairy foods daily for people eating fewer than 1,600 calories or three servings for people eating more calories than that. Low-fat dairy provides calcium and vitamin D, which promotes bone health. Whole grains are a good source of B vitamins, Vitamin E, magnesium, iron and fiber, and they make a better choice than processed grains. Protein is an important part of a healthy diet. Nails and hair are made up of mostly protein, and your body needs protein to build strong bones and muscles and for healthy skin and blood. Bodies don't store protein, so foods that contain protein need to be a regular part of a healthy diet. Low-fat protein options are plentiful. Along with being low-fat, fruit is also low in sodium and offers natural vitamins, minerals and plant phytochemicals. Juicing fresh fruits makes a delicious low-fat drink. You can also mix fruits for a wonderful fruit salad or eat them alone as a snack. Vegetables are also a natural food packed with vitamins and minerals. They are low-fat and low in calories and a good source of dietary fiber. Nuts and seeds are high in fat content and do not meet low-fat criteria. However, eating nuts and seeds in moderation (fewer than 2 ounces per day) can be part of an overall healthy low-fat plan. Remember the importance of learning to read and understand the nutritional information on food labels. In order to make mealtime tasty, learn different low-fat cooking methods. Understand the difference between healthy fats and unhealthy fats in your food. Learn how to make healthy low-fat food choices. When cooking, there are a number of ways you can reduce fat by making healthy substitutions. Replace half of the oil when you bake with an equal amount of unsweetened applesauce. Use a lowfat cooking spray, such as Pam when sauteeing. Use non-stick pans and eliminate the oil. Stir fry using water instead of oil. Use fat-free mayonnaise, salad dressing, and similar condiments. When marinating, skip the fat and use herbs, spices, and acid such as lemon juice or vinegar instead. Replace whole-fat or 2% milk products with non-fat. Choose cooking methods that minimize fat including grilling, broiling, and steaming. The USDA My Plate recommends eating a diet that contains 30 percent of its calories or less from fat. Low-fat foods are considered those with 30 percent of their calories or less from fat. Multiply the grams of fat per serving times nine. Multiply the grams of carbs per serving times four. Multiply the grams of protein per serving times four. Multiply the grams of alcohol per serving times seven. Add the results of steps one through four. Divide the number obtained from step five by the number obtained in step one (fat calories/total calories). Multiply this result times 100 to obtain the percentage of calories from fat. While making sure you keep the overall fat percentage down is essential, eating low-fat isn't going to help much for weight control if you eat giant serving sizes. A kitchen scale is an effective way of measuring serving sizes. For packaged foods, follow the serving size recommendations on the nutrition label.